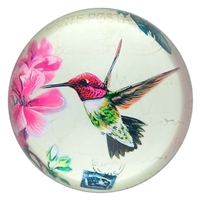 Glass Paperweights with themes in nature, alternative designs and novelty. Blue and coral nautilus art glass paperweight. 3pc minimum. Must order in increments of 3,6,9, etc.. Colorful feathers and arrows glass paperweight. Pink sugar skull with floral background. Green sugar skull with black floral background glass paperweight. Lovely unicorn paperweight in bright pinks, yellows and blues. Clear glass paperweight with a lovely dragonfly! Vintage scientific skull illustration in a clear glass paperweight. Spider illustration inside clear oval paperweight. Beautiful bee drawing seen through glass paperweight! The perfect gift for anyone. See all of our selections from this line to make an eye-catching display! Beautiful greens and blues shown off by this strutting Peacock. See all of our selections from this line to make an eye-catching display! Beautiful free-form spiral nautilus art paperweight. See variety of matching magnets KA230. She's the new "It" girl... Day of the Dead sugar skull styling with a modern twist. Year-round unique gift! CLEARANCE Price shown Now over 60% off! Day of the Dead styling.. one cool guy!CLEARANCE Price shown Now over 60% off! Unique design of Day of the Dead Virgin. Multi-use Hamsa wall plaque also with Small hole in the middle for burning incense sticks. Or use it as a decorative accent or paperweight! Gold with antique emerald undertones. 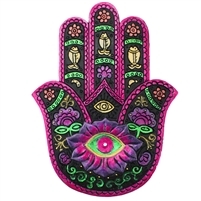 The Hamsa, is a palm-shaped amulet and commonly used in wall hangings and jewelry. Depicting the open right hand, it is an image recognized and used as a sign of protection and believed to provide a shield against evil.